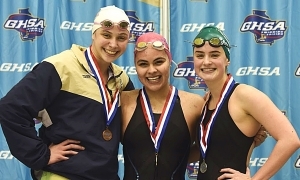 Junior Jade Foelske of Chamblee became the first DeKalb County girl to win two gold medals at the same state meet since Lakeside’s Katie Suhr in 2006. Foelske who won gold medals in 2016 (100 butterfly) and 2017 (100 butterfly) captured her third consecutive gold medal in the Class 4A-5A 100 butterfly (54.36) and became a four-time state gold medal winner by capturing the 200 individual medley gold (2:01.27) at the McCauley Aquatic Center at Georgia Tech. 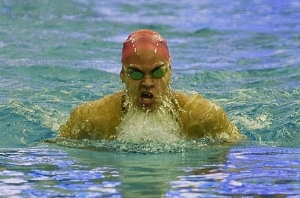 She was the first DeKalb girls’ entry to win an event three consecutive years since Callie Emery of Peachtree won both the 50 freestyle and 100 freestyle from 1979-1981. The junior also was part of the Chamblee 200 medley relay team that won gold in 2017. Foelske’s performance along with a fourth place finish (3:43.12) by the 400 yard freestyle relay team of Molly Bruning, Le Changivy, Teresa Maloney and Foelske and sixth (1:51.00) by the 200 yard medley relay team of Maloney, Mary Adam, Foelske and Bruning helped the Lady Bulldogs to an eighth place finish in the Class 4A-5A standings. In the boys’ Class 4A-5A, Chamblee picked up a third place finish with 263 points behind St. Pius X (333) and Woodward Academy (295). Alexander Miretsky, Caleb Perry, Theo Hardy and Louis Cardot teamed up for a silver medal finish (3:12.18) in the 400 yard freestyle relay to lead the Bulldogs to the top finish by a Class 5A school. Perry, Hardy and Cardot also picked up fourth place ribbons in individual events to aid the Chamblee cause. Perry was fourth in the 200 yard individual medley (1:59.11) with Hardy fourth in the 50 yard freestyle (22.04) and Cardot fourth in the 100 yard backstroke (51.38). The Dunwoody Wildcats rode three bronze medal finishes to a fifth place finish in the Class 6A boys’ state meet with 145 points. Sophomore Grant Allison grabbed a pair of bronze medals in the spring races. He swam a 21.53 for third in the 50 yard freestyle and took third in the 100 yard freestyle in 46.60. Allison teamed with Juan Martinez, Parker Bragg and Nicholas Bragg to take the bronze in the 200 yard freestyle relay (1:29.33). The Lady Wildcats got a Top 10 finish with 136.50 points led by the performance of sophomore diver Lauren Davis. Davis scored 470.50 on her 11 dives to capture the silver medal in one meter diving which was held across all classes. 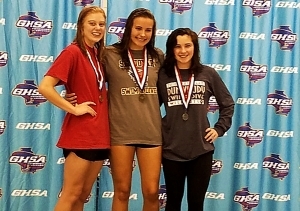 Ashley Altera took fourth in the 200 yard freestyle (1:54.29) and sixth in the 100 yard butterfly (57.75) as another big contributor in Dunwoody’s Top 10 finish. Lakeside cracked the Top 10 in the Class 7A boys’ state meet with 151 points good for ninth overall. The Vikings got a fifth place finish in the 100 yard butterfly (51.03) from freshman Kamal Muhammad and a sixth place in the 100 yard breaststroke from junior Gavin Wheeler (58.28).